Posts related to David Tennant in the Press on Blogger.com (usually with more detail). 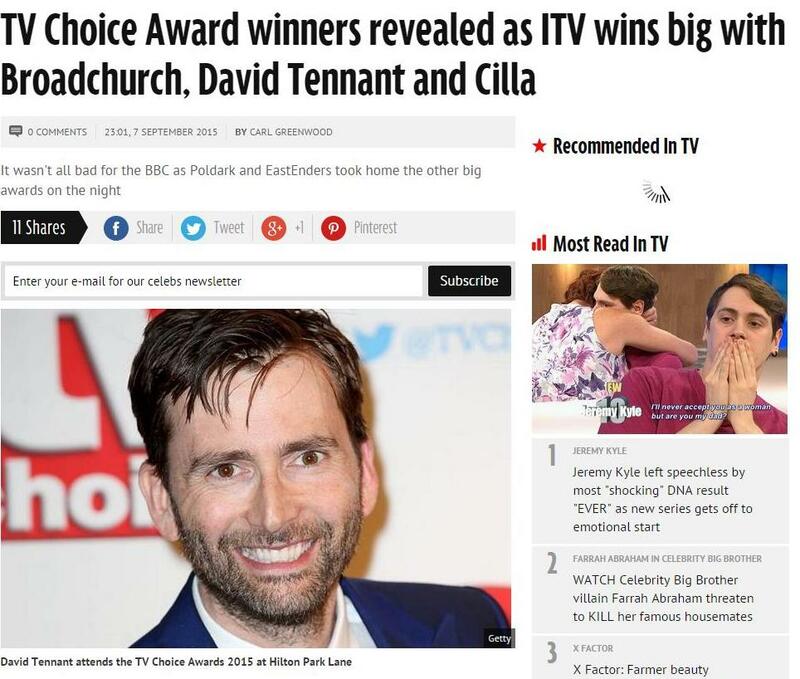 Broadchurch won the Best Drama Series Award at the TV Choice Awards tonight! Doctor Who book Forever Autumn to be republished by BBC Books on Thursday 27th August. The release date of the UK edition of Marvel's Jessica Jones: Season One book has been delayed to 23rd June 2016. Broadchurch has been nominated in the French TV Notes 2015 Awards in the Best Foreign Series category. Radio Times has posted a photo of David Tennant recording Jake And The Neverland Pirates. David Tennant, Broadchurch, Doctor Who and W1A are nominated in the TV Choice Awards longlist. David Tennant has been nominated for the Best Actor Award (for Broadchurch), Broadchurch has been nominated for the Best Drama Series Award and W1A is in the list for the Best Comedy Show Award. Also Olivia Colman is nominated for the Best Actress Award for Broadchurch and Doctor Who for the Best Family Drama Award. Daily Mail has a brief interview with David Tennant tonight from the What's On Stage Awards where he said about Broadchurch "I think we're a victim of our success to be honest. The first series was such an extraordinary thing. This country, we never allow lightening to strike twice in this country...we just don't let that happen. So, inevitably there was going to be a certain amount of 'it's not as good as the first time'. I think it is. I think it's a wonderful series that I'm very proud to be part of." Daily Mail added that he remained tight-lipped about how he felt about a third series or a spin-off for their characters. "There's nothing finer than working with Olivia. I'd like to do that everyday of my life, but I think the story will lead that. In Daily Mail article 91 year old Nicholas Parsons describes David Tennant as 'young, high-profile talent' and 'clearly a very educated man who knows a lot about Shakespeare. 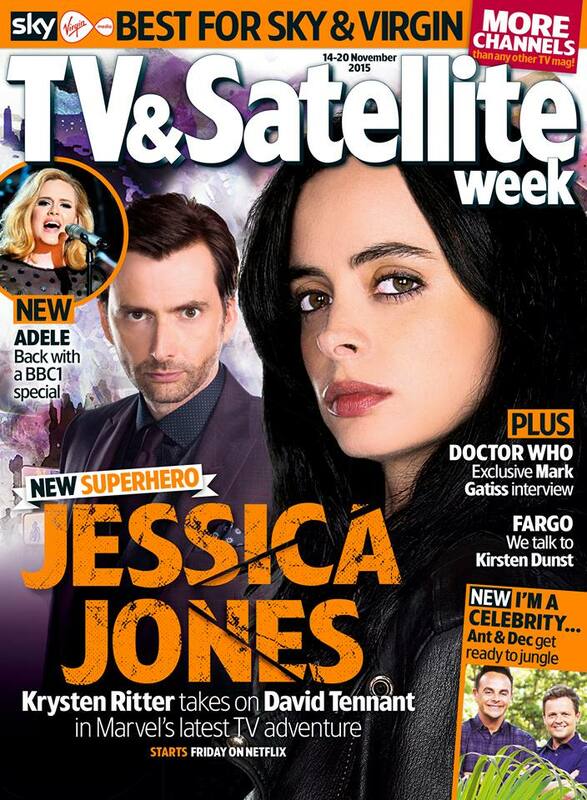 In an interview in Radio Times about Broadchurch, Eve Myles says "We�re lucky to have David Tennant in the UK. He�s a very genuine, generous, outstanding leading man and I really can�t speak highly enough of him. He�s a dear friend. And I�m really pleased that we�ve got someone like David Tennant in the UK to fly the flag for us as a brilliant British actor." Daily Mail has some paparazzi photos of David Tennant leaving the Radio Times Covers Party last night. 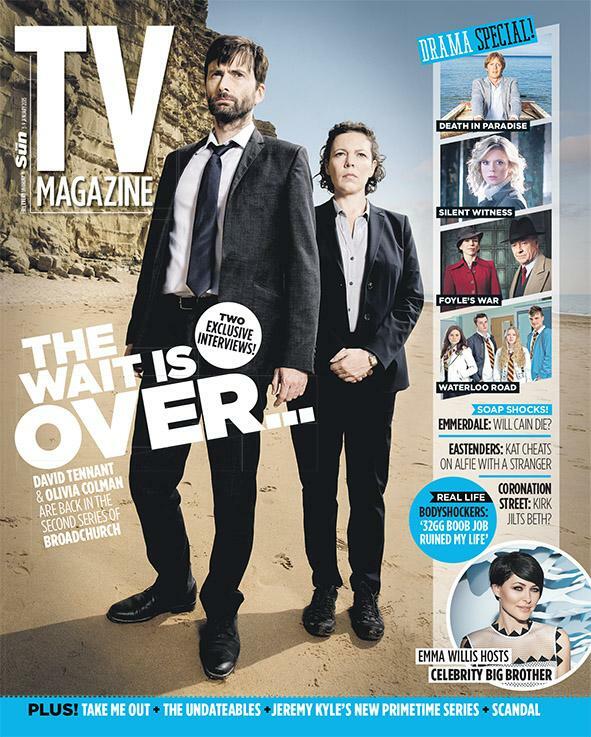 Broadcast (behind a paywall) reports that at the halfway point of Broadchurch, it has scored almost 1 million more viewers than ITV�s slot average of 5.3m (23% of those watching television at that time) for the past 12 months. Marvel has today announced that David Tennant will play the main villain in its upcoming Netflix series A.K.A. Jessica Jones. 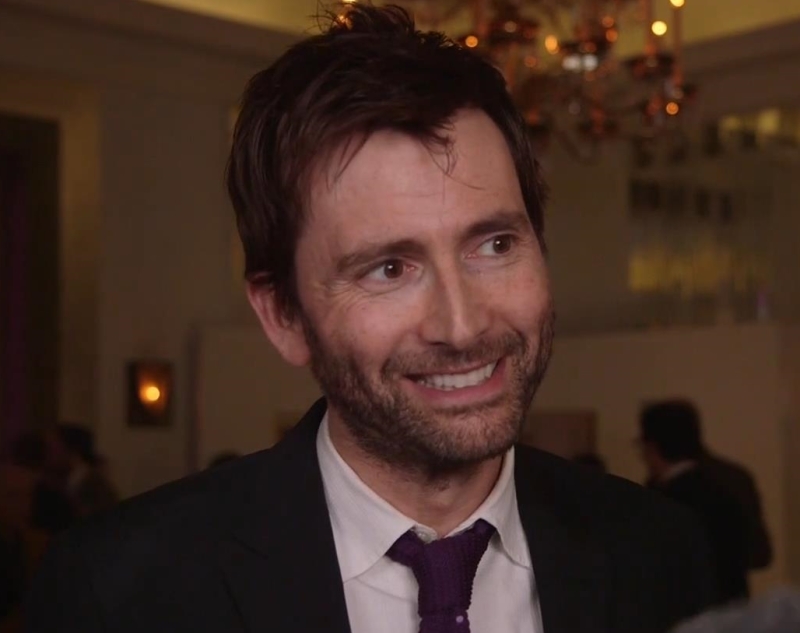 David will play Zebediah Killgrave (who is also known as The Purple Man). A.K.A. Jessica Jones is scheduled for a 13 episode series and will premiere on Netflix sometime later in 2015. 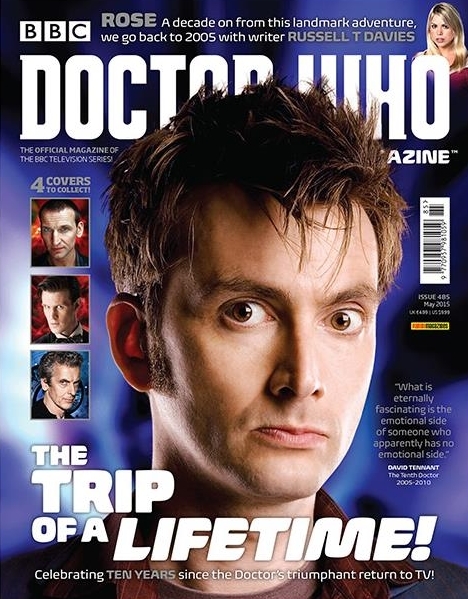 David Tennant episodes dominate the Radio Times Doctor Who poll for Fav Episode From The New Era. Digital Spy brief interview with David Tennant at National Television Awards last night includes "I always thought the first line of my obituary had been written after Doctor Who and then Broadchurch came along and suddenly it kicked off again in a different direction. Daily Star has a preview of Pets Wild At Heart. The Telegraph review of Broadchurch concludes with 'Tennant and Olivia Colman were, as ever, terrific. Colman proved that no other actress is as good at utter emotional desolation, while Tennant was in a mercurial mood, reminiscent of his tenure in Doctor Who. 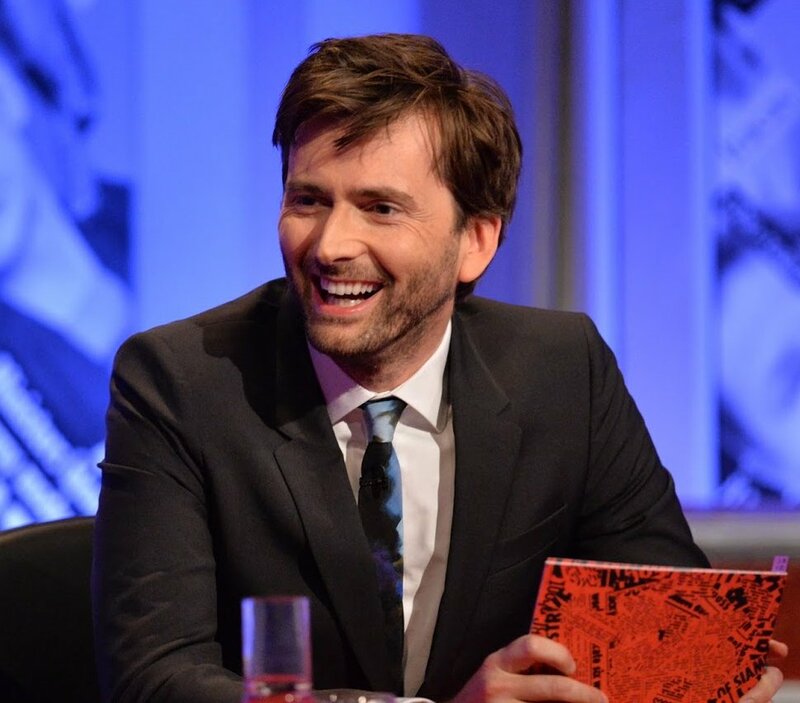 David Tennant is in the final round for the two awards Favorite Actor In A Television Series and Favorite British Artist Of The Year in The 2015 Anglophile Channel Awards.